This theme seemed to be repeated many times throughout the vigil as nearly all of the speakers mentioned how Ellie’s heart and spirit outsized her body. Hundreds of people attended the vigil and stood in solidarity. They stood in silence, sang at times, held candles and released 21 balloons to represent Ellie’s 21 years of life on this Earth. “She had the biggest smile. She had the biggest heart. She had the biggest sense of humor. 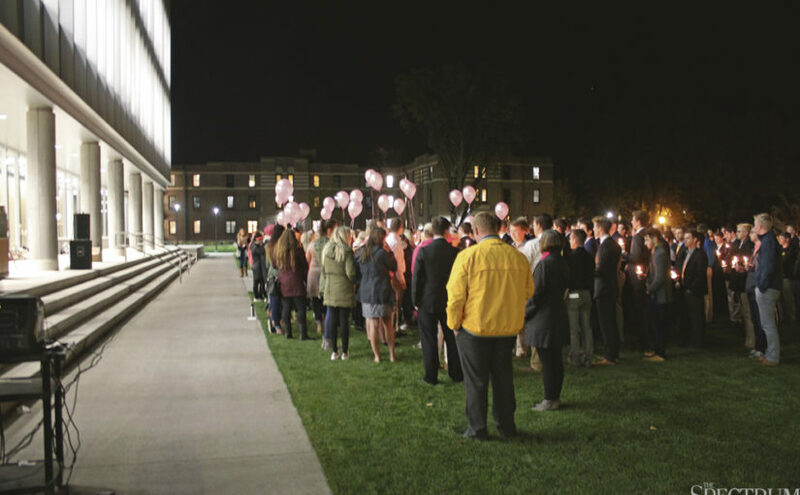 And the only thing to this day that I will ever see bigger than Ellie’s love for everybody is the love of the community for her,” Interfraternity Council president and friend of Ellie, Alex Stangel said. Stangel also went on to say how Ellie helped him become the person he is today and how one day, when he is lucky enough to have a daughter, he will contact Polly Helm — Ellie’s mother — to get pointers because he wants his future daughter to be just like Ellie. “I always wanted an older brother growing up. But what I didn’t know, was how much I needed a 21-year-old sister,” Ellie’s cheer partner Roger Dickenson said. “I was the one lifting her up physically, but she lifted me up higher than I could ever imagine.” Dickenson explained how Elizabeth Mary was also the name of his 15-year-old sister and how he can never begin to thank God for blessing him with two beautiful sisters with such amazing names. Dickenson was followed by three friends of Ellie’s — her roommate Haley Pacholl, her Kappa Delta “little” Sydney Yingling and sorority sister Molly Berdan — who vowed to live as Ellie lived: strong, loving and selfless. The last speaker of the night was her friend Amy Mueller. “I am blessed to have shared countless fond memories and traditions with Ellie,” Mueller said. After Mueller spoke, candles were lit, the music played and the balloons were released. When students were told the vigil was over, everyone stood still holding their candles in silence. It was not until minutes later people started to blow out their candles and depart. The vigil took place Oct 9. at 8 p.m.